Create a direct mail campaign that will boost your profits! Our Premium Traffic Mail 2.0 provides you with a daily list of people that need your services now! Let us mail your letters while you concentrate on your clients! How Does Traffic Mail Work? Premium Traffic Mail 2.0 provides you with case details for records that were entered in the MD court system the previous business day. You choose the counties you wish to receive data from, then logon to our website in the morning to pick up your cases. Mail merge this file with your favorite word processor and you have personalized letters to send to the people that need your services now! How do Postnet barcodes help me? This will enable you to reduce mailing costs by obtaining bulk mailing discounts from the post office. We now include Postnet barcodes in ALL output files for all addresses. Minor adjustments to your mail merge process enable the printing of the Postnet barcode on every envelope. If your company does not wish to utilize the Postnet barcode, there should be no changes necessary to run your mail merge as you would normally. How Do I Mail Letters? Let us merge and print your letters and envelopes for you. Choose your paper type, layout, etc. and we’ll take it from there. One low price per piece for the data, address correction, paper, printing, stuffing, sealing and postage, and you concentrate on taking care of your clients. Of course you are able to do your own mailings and we will be pleased to assist with your mail-merge and any other questions. Get started today and watch your business grow! Data supplied by court clerks is subject to human error when entered, resulting in a certain amount of undeliverable addresses. Traffic Mail 2.0 uses USPS Certified Address Correction software to check all addresses. If it is not deliverable, you don’t get it. Save time, postage, materials and money! Our business is supplying the data, not applying it, but we can give you some pointers we have picked up. You can increase your conversion rate by including the access codes we supply on your letters. The prospective customer can go to our website and view a FREE abstract of their charge, with YOUR company name, website and phone number prominently displayed. What is a "Free Abstract Record?" Each name that we send you has a Case ID associated with it. You should include this Case ID along with your unique referral code on the letters you mail to prospective clients, with an explanation of how to use it. 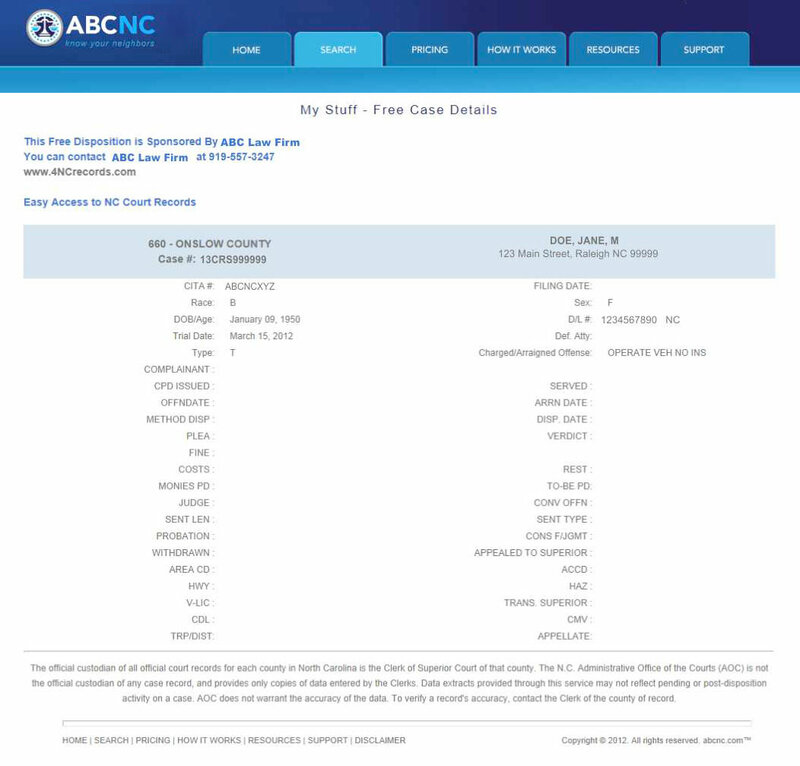 The client can browse to out retail web site, www.abcNC.com, put in these codes and view a free abstract (partial view of disposition) of their case. Your company name, phone number and web site are prominently displayed above the free data. Are you guys traffic lawyers? No, we are in the data processing business. We will never compete against you in the courtroom like some other data providers.